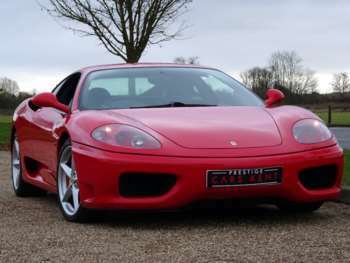 The Ferrari 360 Modena was first released in the UK in 1999. It replaced an icon; the F355 and received some lukewarm reviews at the time, the main bone of contention being its slightly awkward appearance. What couldn't be criticised however, was the 360's engine, a 400bhp 3.6 litre V8 monster. That's 25bhp more than the F355 even though the Modena weighs in 40kg heavier. The 360 was originally available as a manual or 'F1' style paddle gearbox. As time has passed, the 360 has become accepted as one the classic Ferraris and there are some reasonable early used 360s available. 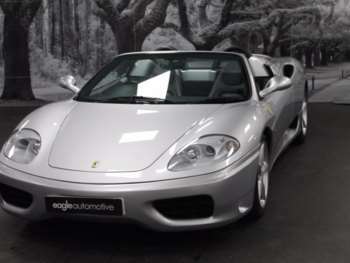 The 360 Spider was launched in October 2000, again with the same gear change option. 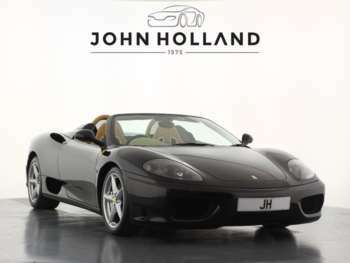 The range was further added to in 2003 when the 360 Challenge Stradale entered the market. This beast is a road legal take on the 360 Challenge race car and sold for £133,025. It is a lighter, tougher and quicker version of the Modena. The Ferrari 360 is an awesome sports car but with much more inherent practicality compared to previous Ferrari super cars. It actually has some boot space for example! It also boasts wide opening doors and narrow sills. Included as standard are dual air bags and a good-looking dash board in stark contrast to the stripped-out appearance of previous models. Let's not kid ourselves though, this is a two-seat mid-engined Ferrari legend, you won't ferry the kids to school in it, but you can chuck the clubs in the boot. A 1999 manual will set you back around £60,000. A 2000 F1 version comes in at about £69,000. Ferrari 360 Spiders and Modenas for sale made after 2002 are actually more costly now than when first released such is the demand for this car. If looking at the F1 model – check the clutch, they have been known to pack up after as little as 5000 miles. With a car like this, adhering to the service schedule is imperative, so check the service history carefully. The 360 needs its cam belt changing every three years regardless of how many miles have been done so make sure this has been done as well. Replacing the cam belt involves taking the engine out and is costly so make sure you don't get lumbered. The 360's only other known fault is a leaky cam cover so get this checked as well. Replacement parts aren't as expensive as you might think for used Ferrari 360s. 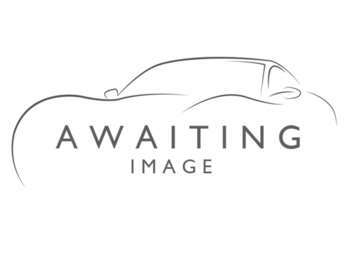 Front and rear brakes are around £200 for the pair, a new clutch is £340, as is a replacement alternator. However, a new headlamp will require £1170 and an exhaust system will relieve you of £2900 or thereabouts. Awesomely – some would say better that the F355 which could feel nervous at its limits whereas the Modena feels planted and resolute. It reaches 60mph in 4.5 seconds and can reach 186mph but it's the handling through the bends where the real thrill lies. 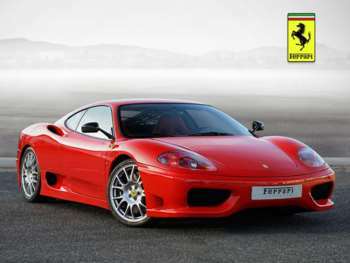 Got a specific Ferrari 360M model in mind?